On Piennolo Cherry Tomato of Vesuvius people wrote, and still write, a lot, especially since it has obtained the EU’s Protected Designation of Origin status, although, about eight years ago, when I started my career path at casa Barone, besides Naples and its provinces, the product was known to the few or “the most”. Lovely to look with its heart shape, small, bright red, the tough skin like the volcanic soil in which it grows, it has the striking ability to continue to “live” even after being harvested, evolving in different sensory nuances during its life cycle and reaching its peak during the Christmas season to the delight of those who, according to tradition, let it dry out to enjoy a plate of red-stained vermicelli with clams on December 24th that has no equal. I have always asserted that the Piennolo is a little tomato that you like or not, it doesn’t leave room for half-measures, and then to love it you need to experience it. Not all the Piennolo tomatoes are the same. They are the outcome of a research done in the field by several farmers who, jealously, look after their seeds. Each family duplicates its own seed, each seed has significantly different characteristics, each seed has its story. From observations made in the farm and on the strength of the pedo-climatic diversities (interaction between climate and soil), Casa Barone selected and spread various Vesuvius Piennolo Cherry Tomato ecotypes. The product’s sensory diversity is such that it can satisfy the most particular consumers and the most demanding professionals in the field. 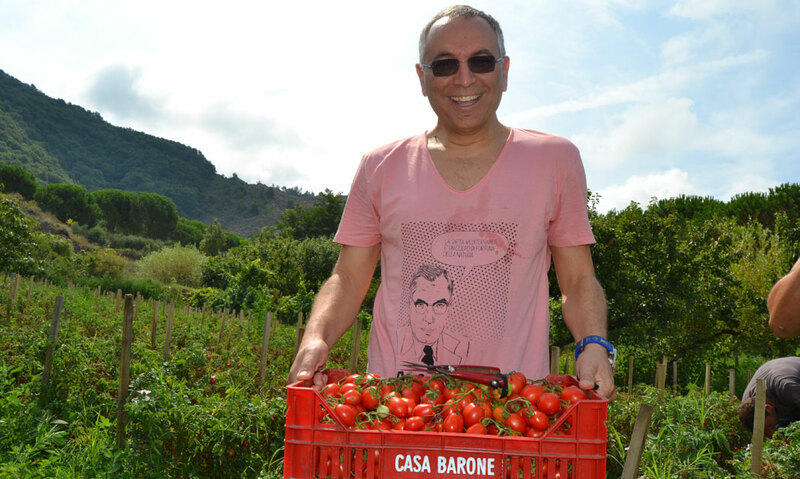 So it was for Enzo Coccia that, just when my path at Casa Barone began, enthusiastically joined to a business initiative, knew our Piennolo tomato organic conserve, he added it to the menu and never left it. In Naples, Enzo was a pioneer in seeking and offering high quality ingredients in his Pizzarias. I have no problems to say that he was the first Casa Barone client for Pizzeria in Naples and, in a time when the company was presenting this first-rate food to the world, I can tell you that he was a big help to us. Time, patience, shrewdness, testing and retesting, for both Casa Barone and Enzo the result is there for all to see.